Education policy in Australia and elsewhere has emphasised the importance of numeracy as a necessary skill for living in contemporary society. While there is global agreement on the relevance of numeracy, there is limited support for teachers in enhancing student numeracy outcomes at the classroom level. 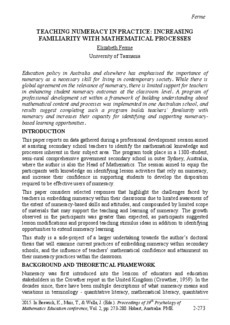 A program of professional development set within a framework of building understanding about mathematical content and processes was implemented in one Australian school, and results suggest completing such a program builds teachers’ familiarity with numeracy and increases their capacity for identifying and supporting numeracy based learning opportunities.